The self-appointed Citizen Advisory Committee on the Oconee County Web Site (CACOCWS) decided tonight to break into four subcommittees to gather information before meeting again to discuss web site policy options and content. Dan Matthews will examine what the county Parks and Recreation Department has done to develop its site, linked to the county main site but quite different stylistically from it. Matthews also will examine how the Planning Department is using the existing county site to provide information to the public about planning issues before those issues come before the Planning Commission and the Board of Commissioners. Tony Glenn will gather information on what the four incorporated areas of the county are doing with their web sites as well as how the Sheriff’s Office and the Board of Education use their sites. Sarah Bell and I will attempt to gather information on the history of the county web site, the amount of money that is being invested in it, how it is managed, and what other kinds of resources the county has to support information technology. Dan McDaniel will explore governmental web sites, with particular emphasis on those in Georgia, in an effort to find those that might serve as models for Oconee County. He also will help the committee develop ways to communicate internally and externally as it goes about its business. The five of us met tonight for an hour at Jittery Joe’s in Watkinsville to outline issues we would like to explore and to develop ways to go about exploring them. We started our discussion at 7 p.m.
Two committee members, Oconee County Commissioner Margaret Hale and Kate McDaniel, could not attend because of last-minute changes in their schedules. The committee is an outgrowth of an announcement I made at the Board of Commissioners meeting on May 4 that I was organizing a citizen committee to make policy recommendations for the county’s web site. I asked the commissioners to join me, and Hale agreed. I also asked the chairpersons of the Democratic and Republican parties in the county to make nominations, and they did. I sought volunteers in a posting I made on this blog on Aug. 29. Finally, I asked the committee members to nominate a seventh member. 1. How might the county web site be used to make public announcements on issues of importance to citizens? What would the county need to do to maintain an archive of such announcements? 2. What is needed to make the site fully and easily searchable? 3. What types of public records might be made available through the web site? 4. What types of court records might be accessible? 5. What types of election and campaign records might be stored for electronic access? 6. Should there be a unified template for all county web sites, or should some of the departments develop sites that have their own style, characteristics and features? 7. What types of recreational information would be most helpful, how might it be organized, and how might the site link to other records on sports and recreational organizations in the county? 8. What kinds of opportunities might citizens be given to respond to or even contribute to the web site? 9. What policy should be created regarding government responsibility in providing information? 10. What kinds of links should be featured on the county cite? Should the site create an easy interface with sites of the four incorporated areas, the Board of Education, or the other elected officials in the county? 11. What can be done to provide for online applications for such things as building permits? 12. What needs to be done to provide the proper levels of security for the county site? In launching the discussion, I said the committee needed to recognize that the county has very limited resources at present and that some recommendations might not be able to to be realized until county revenues recover. The committee decided to create the subcommittees as a means of gathering information to further discussion of the issues on the list. The next meeting will be scheduled once the subcommittees have done their initial work. The committee decided to encourage public participation in the discussion of these issues by creating a web site. Information on access to that site will be provided here as soon as it is available. The Oconee Farmers Market, originally scheduled to close this weekend after the Oconee Chamber Fall Festival, will remain open through the first part of November, depending on weather and what vendors have available, according to Debbie Beese, acting market manager. Vendors will set up this weekend in the market’s usual space behind the Eagle Tavern, and they will be joined by vendors for the Chamber Fall Festival, now in its 37th year. The Fall Festival will run from 9 a.m. to 6 p.m. 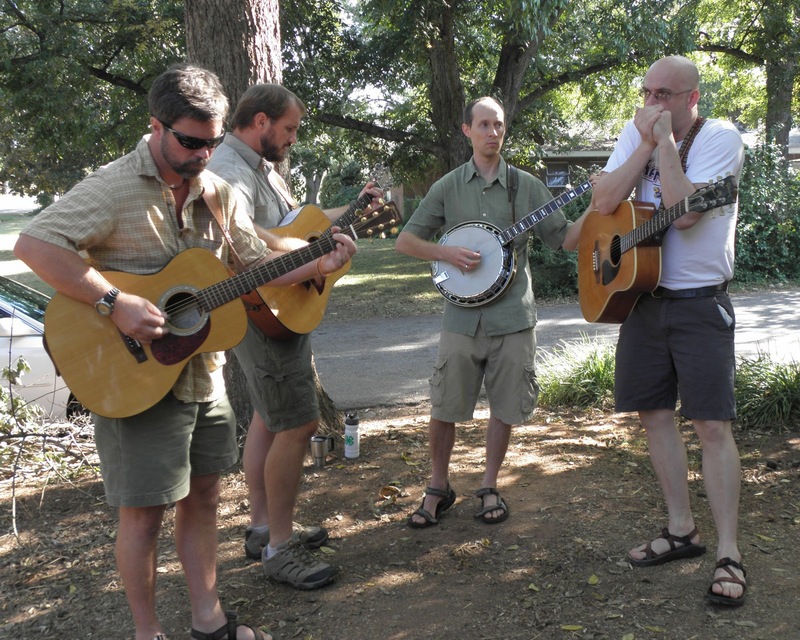 The Red Oak Tree-o, a local band that played at the market earlier this summer, will be appearing again this weekend. At its Sept. 25 appearance (pictured), the Tree-O had four members. Tammy Gilland raised and spent more than $13,000 in her unsuccessful attempt to unseat Margaret Hale in the July 20 Oconee County Republican primary, according to finance records filed by the Sept. 30 deadline in the Oconee County Board of Elections and Registration office. Hale raised and spent just less than $8,000. Hale got 52 percent of the vote to Gilland’s 48 percent. Mark Thomas raised just less than $6,500 in his successful race to become the Republican nominee for Post 2 on the Board of Education. Thomas spent all but $800 of the money he raised. Mack Guest, the incumbent Post 2 BOE member, raised $6,800 and spent about $1,000 more than that in his unsuccessful attempt to be the Republican nominee. Thomas got 71 percent of the vote to Guest’s 29 percent. Carter Strickland, who ran unopposed in the Democratic primary for the BOE Post 2 position, spent a little more than $600, but he did not report raising any money. In the race for the House District 113 seat in the Georgia General Assembly, Hank Huckaby raised more than $114,000 and spent just less than $64,000 in his successful campaign for the Republican nomination, according to records filed with the State Ethics Commission. Kirk Shook raised nearly $16,000 and spent nearly all of it, and Tommy Malcom raised $9,000 and spent that amount. Both also were attempting to secure the Republican nomination to replace Bob Smith, who is retiring. Huckaby is facing Democrat Suzy Compere on the Nov. 2 ballot. Compere reported in her June 30 filing that she had not raised or spent any money on her campaign. The State Election Commissioner web site does not show a report for Compere for the Sept. 30 period, though the grace period for filing the report ended Thursday. Candidates filing before Oct. 14 will pay a $25 late fee, and candidates filing after that date will pay an additional $50 late fee. Oconee lies entirely within the 113th District, which also includes parts of Clarke, Morgan and Oglethorpe counties. Huckaby received 51 percent of the votes in the July 20 primary to 30 percent for Malcom and 19 percent for Shook. The Sept. 30 filings are cumulative, covering the entire first half of this year. Most of the money raised and spent had been reported in the June 30 statements for the candidates for the Oconee County offices as well as for the candidates for the 113th House seat. Huckaby was the only candidate who really added significantly to his totals in the three months after that filing. He picked up an additional $19,000. The 2010 races saw considerably more spending than in those same races two years earlier. In 2008, Hale had raised $6,300 and spent most of that by the Sept. 30 filing deadline. Her opponent in the Republican primary, Esther Porter, had raised $3,600 and spent all of it by Sept. 30. In 2008, Guest had raised $3,400 and spent $4,600 by the Sept. 30 filing period. His opponent, Ryan House, had raised and spent $1,850. Smith ran unopposed for the 113th House seat in 2008 in both the primary and the general election. Trader Joe’s is scheduled to open its first Georgia store outside the metro-Atlanta area on Oct. 29 in a 12,100 square-foot storefront in one of three buildings that make up the Markets at Epps Bridge, 1850 Epps Bridge parkway. The grocery will be just west of Ashley Furniture in space that was designated for Harbor Freight Tools. Harbor Freight Tools now has moved a few doors further west to space that was occupied by Golden Dragon International Buffet, which has closed. Traders Joe’s will be in Building C in the complex, which is behind Building A, which houses the Five Points Deli, and Building B, where NewBalance and Fox’s Pizza are located. According to the application for sale of beer and wine that Trader Joe’s filed with Oconee County Clerk Gina Lindsey on Aug. 30, the sales area for the new store will occupy 9,352 square feet of the leased space, with storage taking up most of the rest. The total square footage for Trader Joe’s at 12,110 compares with the 55,696 square feet occupied by the nearby Kroger grocery. The diagram for the store submitted with the beer and wine application shows a store with four and a half shopping rows offset slightly and two separate produce rows. According to the beer and wine license application, no one connected with the business has been convicted of a violation of any state, federal or local alcohol laws in the last 10 years. When Phil Wofford came before the Oconee County Board of Commissioners on Sept. 28 to answer any questions about his application for the license, it was something of a lovefest. The commissioners said how happy they were to have Trader Joe’s coming to the county, and Wofford said how happy he was to be here. The offer apparently only extended to Oconee County officials. On Oct. 1, the day after the Athens Banner-Herald reported that the store would open on Oct. 29, I called Alison Mochizuki, listed in the Banner-Herald as the director of national public relations for Trader Joe’s and the source of the information in the story on the store’s opening date. When I got an answering machine, I left a message asking Mochizuki to call me. I also called the main switchboard and was told that Mochizuki is the public relations department for the company and that she was the only one who could answer any questions I had. I found a press release from earlier this year online that listed Mochizuki’s email address, and I sent her an email as well, asking her to call me. I next called the number in the alcohol license application given for Wofford and also left a message. By Monday morning, I had heard nothing from Mochizuki or Wofford, so I started calling again , leaving repeated messages. I also sent another email to Mochizuki. Finally, on Monday afternoon, Mochizuki called me back, but I was in a meeting and could not take the call. I returned that call and left several more messages that afternoon. On Tuesday I started over with both Mochizuki and Wofford. Mochizuki called me back about noon yesterday. Mochizuki confirmed the opening date, told me the opening time, and then asked me to tell her “again” which media organization I represented. I told her I was a citizen who did a blog, and she said I had to talk with Customer Service rather than her. Mochizuki then asked that I not quote her by name. I told her I would not agree to that. She confirmed that the Oconee County store will be the first for Trader Joe’s in Georgia and outside Atlanta, where the company operates six stores. She also told me that the normal business hours would be from 8 a.m. to 9 p.m. daily. I asked her if the store would be localized in any way, and she said there would be paintings at the front of the story that were local. I next called Customer Service, and someone named Amy answered. She would not give her last name. She told me she could not confirm the opening date of the store other than that it would be by the end of the year. She said the opening would be posted on the Trader Joe’s web site when it was finalized. I asked her if the store would be any different from the ones in Atlanta, and she said the stores were decorated locally. To whom the store makes donations is determined locally, she said. She said there would be no local product differentiation, though the stores do vary somewhat by region. The Banner-Herald story said the store would be located at 1850 Epps Bridge parkway, which is the address for the Markets at Epps Bridge shopping center. The story didn’t mention the Markets at Epps Bridge by name or any of the nearby stores. The story did mention that the store’s employees dress in Hawaiian shirts. Wofford was wearing a green, white and black print shirt with a complex design when he appeared before the BOC. I made a mistake in an earlier version of this report. I said that the Banner-Herald reported the opening date to be Sept. 29. It did not. The paper had the opening date right. I called Trader Joe's simply to confirm what the paper had reported. I apologize to Erin France of the paper, who was kind enough to point out the error to me. The Oconee County Board of Education this evening officially selected Wayne Bagley from among three finalists to fill the Post 5 position on the Board left vacant when Tom Breedlove resigned on May 10 and moved out of state. The announcement brings to an end a lengthy selection process that first saw the Board attempt to fill the vacancy from among the four announced candidates for other positions on the Board and then switch to an open competition that brought in 17 applicants. The Board narrowed that list of 17 down to three finalists, Bagley, Michael Burnette and Glenn Townsend--on Aug. 9 and interviewed the three finalists on Sept. 2. Bagley and Burnette attended the meeting and stayed after the regular meeting ended at 5:30, though no official indication had been given that an announcement was to be made. After about five minutes in executive session, the Board returned to the meeting room. Board Chairman David Weeks asked for the agenda of the meeting to be modified so the Board could announce the selection of the Post 5 member. Weeks then nominated Bagley, who was supported by the three other Board members. Superintendent John A. Jackson gave me a prepared press release as soon as the announcement was made, and the announcement was put onto the school system web site after the meeting. Bagley is vice president of development for Lassiter Properties, Inc. Based in Morrow, southeast of Atlanta, Lassiter owns and operates timberlands in the U.S.
Bagley holds a bachelor’s degree in finance from the University of Georgia and a master’s degree from West Georgia College. Bagley will fill out the term of Breedlove, which runs through 2012. At least one more new face will join the Board after the November elections. Mack Guest was defeated in the July Republican primary by Mark Thomas. Thomas faces Democrat Carter Strickland on the November ballot.